Painted to look as though the painting itself is a window, this is an early example of a conceit, which became highly popular in Dutch seventeenth-century art. The artist clearly hopes to entice the viewer to engage with the boy. He is painted staring directly out, his eyes and mouth at once mocking and welcoming. His left hand rests on the ledge of the window whilst his right finger is tapping the glass. The window, it would seem, is on the ground floor, because the gaze of the boy is level, rather than looking downwards. 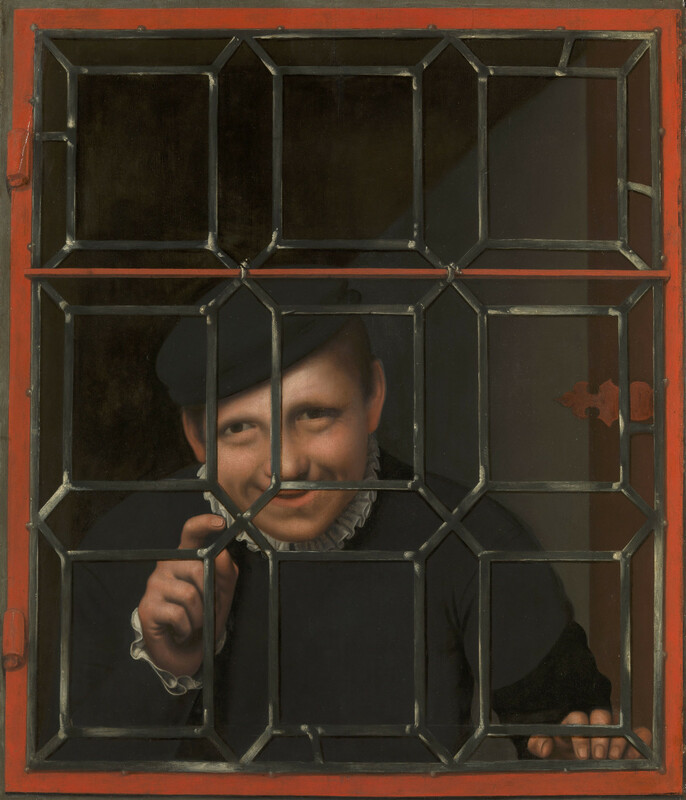 The idea of the frame-within-a-frame derives from earlier Netherlandish portraits placed within a fictive frame or placed behind a stone parapet. These earlier sources are developed here so that the figure is placed behind a realistic casement with lead partitions and hinges painted the same warm red colour as the window frame. The catch on the right is also red, and is a decorative shape. The boy's left hand held directly below the catch suggests that he may be just about to throw it open and talk to us. It is difficult to say who the boy is and even where the painting was executed. With his plain dark clothes and cheeky manner, the boy would seem to be a servant, perhaps even a licensed jester. In the inventory of Anne of Denmark's collection in 1616 the painting was described as 'A Picture of a Buffone' (that is, a fool or jester). The painting was once believed to depict one of Henry VIII's jesters, presumably painted in England by a Flemish master, but there is no evidence to confirm this. On the back of this panel is the HP brand of Henry, Prince of Wales (elder brother of Charles I). After his death the painting was in the collection of his mother, Anne of Denmark, who hung it at Oatlands Palace. It remained there throughout the reign of Charles I until his execution in 1649, when it was listed in the Commonwealth Sale as 'One lookeing through a Casemt', unattributed and valued at £3. It was sold to a Dividend headed by Robert Houghton, the King's Brewer. Although no attribution to a particular artist can be suggested, a revised later date of c.1600–1610 has recently been proposed for the painting on the basis of the style of the windows portrayed, which also suggest an English setting.